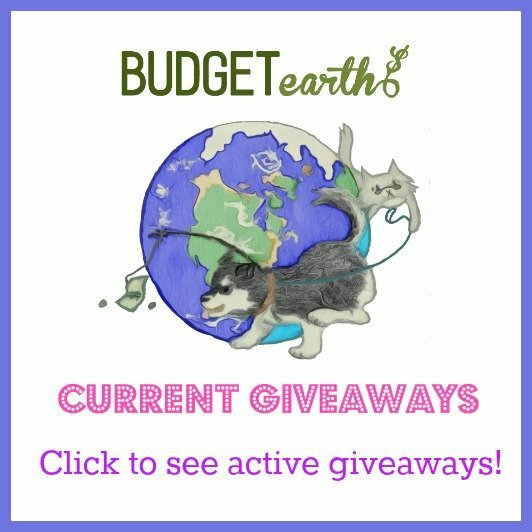 Do you love the thought of spoiling your fur baby during the holidays? I will freely admit, I spoil our dog and already have a pile of toys stockpiled for her to unwrap Christmas morning with the rest of the family. To us, Reya is a member of the family, just like everyone else. With the holidays nearly being here however, that means another thing is coming for where I live – winter. In the Cincinnati area, it is not too uncommon for us to actually have snow on Christmas morning, or throughout the month of December. Once the cold weather is here, it usually stays until April or early May. While Reya loves playing out in the snow, she isn’t too much of a fan of coming inside cold and hungry. Luckily, we found the perfect holiday treat for putting in her stocking this Christmas – Honest Kitchen’s Winter Warmers Broth. 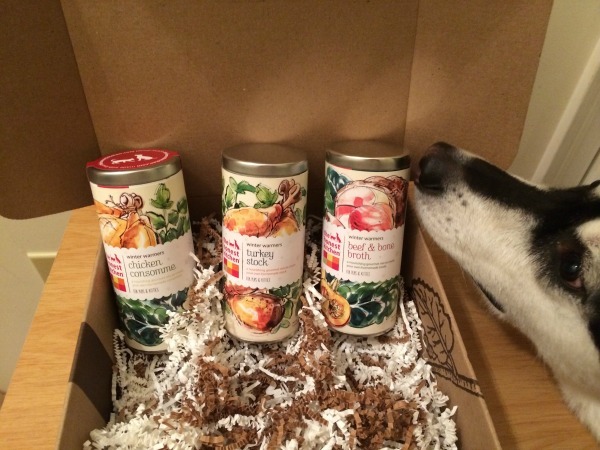 Looking for the perfect treat for man’s best friend this holiday season? If so, we think you will love Honest Kitchen’s Winter Warmer Broth. This set of three dry broths looks very similar to powdered chicken and beef broth, but better since it includes a mix of different herbs that are perfect for your favorite dog. The set includes 3 broths – Chicken Consomme, Beef and Bone, and Turkey Stock. All you have to do is put two tablespoons of dry brother in hot water, wait for it to cool, and then watch your dog enjoy their favorite treat of the holiday season. Not only does it help keep your dog warm, but hydrated and happy throughout the winter season. If you are looking for the perfect stocking stuffer for your dogs, nothing beats Honest Kitchen’s Winter Warmers Broth! Okay, before I go any further, I have to say that I think this holiday broth is a dog owner’s best friend. From the moment we open one of these canisters, Reya is in the kitchen begging and hopping. While it may end with 10 – 30 minutes of crying and whining while she waits for it to cool, afterwards you get the happiest dog ever. After having this tasty, warm broth in her tummy, Reya is unusually mellow and napping happily at our feet. It has been a long time since I have seen her love a treat this much. Reya has always loved Honest Kitchen’s products, but their broth has to be an absolute favorite. She loved this stuff so much that I ended up buying another 2 sets of this broth just so we have enough for the rest of the year. As you can see from the video and pictures, she is a big fan! 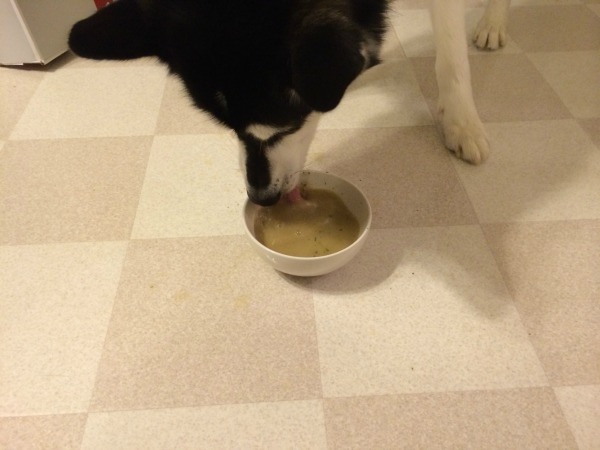 Would you love to try some of this awesome broth of your own dog? You can buy this awesome three pack set of winter broth for only $19.99. While this may seem pricy, realize that each of these cans come with lots of servings, allowing you to use this broth to warm your pup throughout the winter. Once your dog has tried, I am fairly certain they will go nuts for it, just like our Reya! If you want to get this broth though, make sure to hurry, since its only being sold for a limited time. Once their stock is gone, that is it until next holiday season! JUST ADDED! Honest Kitchen is offering $2 off the broth for our readers! Just use the following discount code – BGWW14! Would you like to try this broth for yourself? We are excited to be working with Honest Kitchen on this fantastic giveaway! 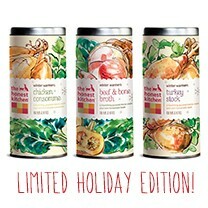 Once lucky dog or cat parent will win a full set of Honest Kitchen Winter Warmers Broth, valued at $19.99. To learn more, make sure to read the rules below and then enter through the Rafflecopter. One lucky reader will win an Honest Kitchen Winter Warmers Broth Gift Set. Sweepstakes ends November 28th at 11:59pm ET. I am always looking for healthy foods or treats for my two cats. They love broth & I think they would totally like this product. I would love to try this for my little guy, Mr. Frodo! He thinks he’s supposed to eat what we do, so this would be great for him. I’d love to try this broth because my cat has been thumbing his nose at his wet food lately. The poor thing gets UTI’s and therefore must have as much liquid in his system as possible to help avoid them in the future. The little booger loves to lick all the gravy off of the wet food and then will only pick at the actual food. These broths seem to be the perfect answer! I never knew they made such a thing,I would love to be able to give this to my dog on a cold morning,many times we don’t think about our dogs having to have cold pet food every day this would warm them up nicely. I make a lot of soups and casseroles in the winter time and would love to try this product. I am always open to try new products. Thanks. This would be a time saver, off to follow the link to purchase. I would like to try this broth for my 3 cats. I have one elderly cat, and one cat with IBS, so a soothing broth would be something I think might be a good addition for both of them, and I am sure the 3rd cat who is young and healthy will enjoy it during the cold upstate NY winter, too! I would love for my dog to try this. I think she would love it. I have five Treeing Walker Coonhounds and three cats – all rescues. I’ve found that there are times when one of my furbabies feels a little under the weather I need to “doctor up” their regular food to make it more palatable to them. My senior Coonhound, Suki, isn’t eating the way she used to and has lost some weight. I’d love to try this to encourage her to eat more. I’d like to win this and spoil my aging dog!! I would love to give this to little Einstein. He is so cute and loves to play out in the snow. These Winter Warmers Broth would be perfect for him! I would like for my dog to try this broth because I think it would be a good solution for me as I am always trying to make my own broth for my dog and I worry about it being healthy for him. I give my dog broth quite often. This broth looks super nice! I would love to have this be a present under the tree for him. I am sure he would love it. I would be excited to try another broth and see how he likes a warmed broth! I’d like for my little ones to try something new. This looks like something they might like.